A few months back we had a patient in our clinic that would come into the office every few weeks with symptoms of a UTI. The patient had the classic suprapubic tenderness, burning with urination, increased urinary frequency. No flank pain, or fever, with stable vital signs. Each time an in-office urinalysis was completed, and each time the results always showed negative nitrites, blood, glucose, protein, and leukocyte esterase. Stone cold normal. Microscopic urinalysis always confirmed this as well. I did not have a great idea of what was causing the patient’s symptoms. The patient was a smoker and did drink a lot of Mountain Dew daily, but other than that was pretty healthy other than generalized anxiety disorder which was treated with Citalopram. Before establishing care with our office, the patient had a referral placed with urology already. The following week the patient saw the urologist, and after review of their office note, the patient was started on pentosan polysulfate, amitriptyline, and hydroxyzine for Interstitial Cystitis. Once I read this note, I recalled the diagnosis, but could not remember how to diagnose accurately or even what the treatment was. Thankfully by reading the note done by the urologist, I knew how to treat appropriately, but I did not know what exactly was pointing them to this diagnosis. I went to my learning issue from PA school and other resources to learn more about this diagnosis so that next time I could perhaps be one step ahead. Today we will discuss this diagnosis, the presentation, examination, laboratory testing, and treatment of interstitial cystitis. Interstitial cystitis is a disorder that often presents with symptoms of dysuria, dyspareunia, and bladder or pelvic pain along with increased urinary frequency and urgency. This disease affects women more commonly than men, and in the United States, it is present in 1.2 million women and 82,000 men. The cause and pathophysiology of interstitial cystitis are not entirely known to date. 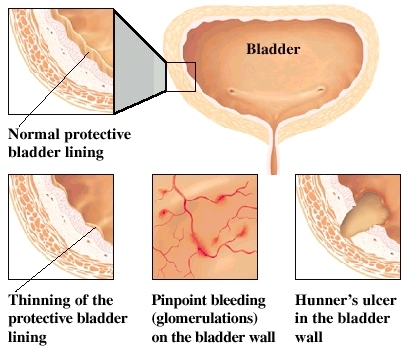 However, research has shown that the underlying factor leading to the clinical findings is damage to the urothelium, which typically acts as a barrier to protect the urinary bladder. If the bladder interstitium becomes damaged, it produces cytokines that then activate mast cells in the area. The activation of these mast cells causes neuronal excitability causing further mast cell activation. 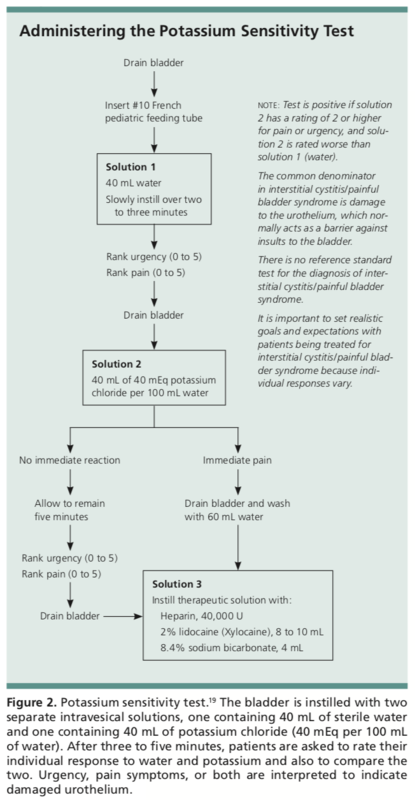 This process is believed to be part of the cause of the pain, frequency, and urgency that patients struggle with during interstitial cystitis flares. The most common cause of this vicious cycle of mast cell activation in the urinary bladder interstitium is when potassium diffuses across the damaged urothelium. There is no standard set of criteria for the diagnosis of interstitial cystitis. In the 1980s the NIDDK founded criteria for clinical diagnosis. These criteria were based upon findings on cystoscopy, such as Hunner ulcers and glomerulations, which are now known to represent severe disease. However, these criteria are now believed to be too strict for clinical diagnosis, due to numerous conditions having symptoms that overlap. 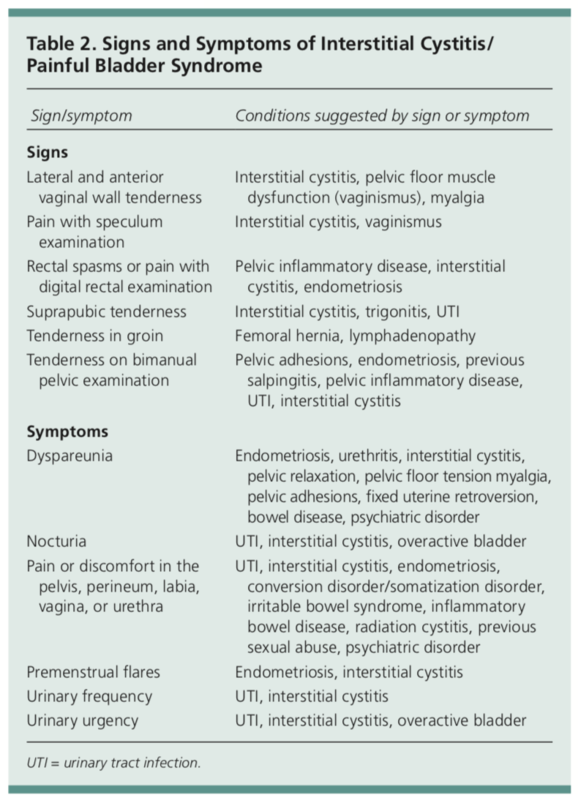 The symptoms of interstitial cystitis overlap a plethora of other common diagnoses. Often it has symptoms similar to a UTI, but the urinalysis and urine cultures will be negative. 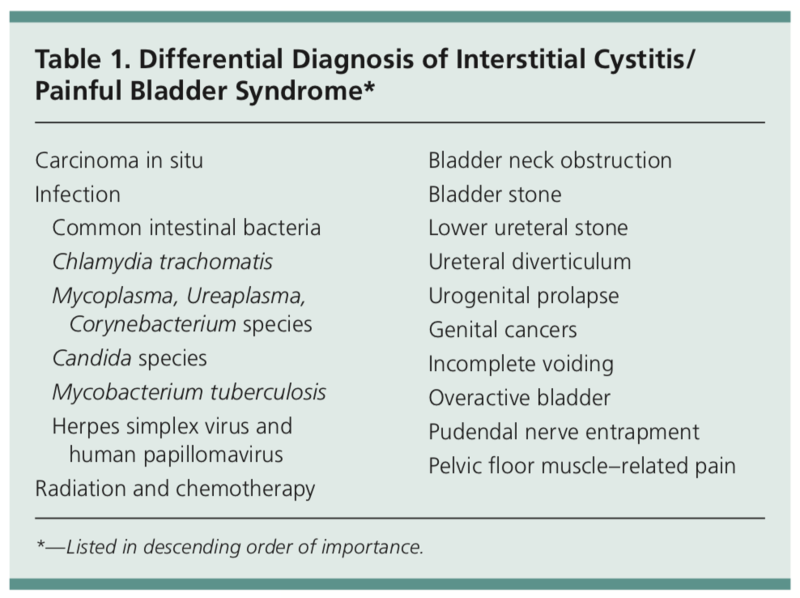 Below is a list of characteristic findings associated with interstitial cystitis, but also with numerous other conditions that could be on your differential list. The examination of patients with suspected interstitial cystitis includes a pelvic and digital rectal exam. There may be presence of pelvic floor or rectal spasms or suprapubic tenderness. Laboratory testing should include a urinalysis and urine culture. Other testing should be completed or may be needed based on clinical findings. The thought behind this test is that an abnormally permeable bladder urothelium will allow excess potassium to collect in the urinary bladder interstitium causing the classic symptoms of interstitial cystitis. Below is an algorithm on the procedure for this testing. Another test for diagnosis includes the anesthetic bladder challenge, where lidocaine is instilled into the urinary bladder. Resolution of symptoms suggests that symptoms are coming from the urinary bladder. Cystoscopy with distention of the bladder with water was used for diagnosis based on the NIDDK criteria, but it has since been found that this is unneeded for diagnosis. This procedure was also found to have risks of bladder and urethral tears/perforations. Bladder biopsy is not regularly needed for diagnosis and is not commonly done in the United States. In Europe however, biopsies are regularly completed. Biopsies can aid in ruling out carcinoma if there is any concern. 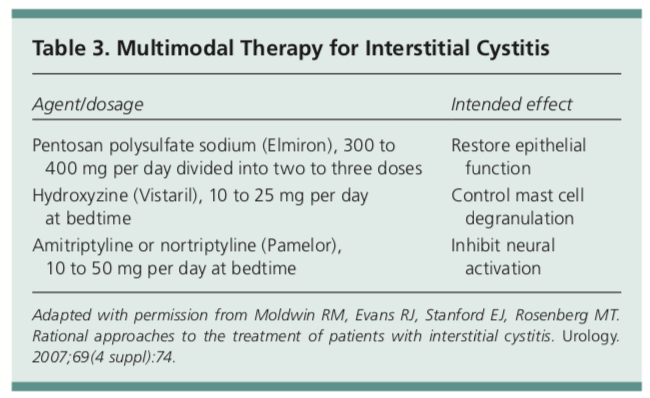 A multi-medication regimen is currently being used for symptom relief in patients with interstitial cystitis. However, this trifecta of medications still needs to be tested under a clinical effectiveness trial.1 These three medications are pentosane polysulfate, an antihistamine such as hydroxyzine, and a tricyclic antidepressant such as amitriptyline. Pentosan polysulfate sodium is the only medication approved by the U.S. FDA for interstitial cystitis. It was initially approved in 1996, and it is believed to repair damaged urothelium. Amitriptyline can be used to help minimize symptoms and is believed to reduce excess neural activation. Same with hydroxyzine where it is thought to work by controlling mast cell activation. Thus far, dimethyl sulfoxide in the only intravesical therapy approved by the FDA and is used for six to eight weeks during treatment. A final therapy that may be used is sacral nerve stimulation, but this just helps with the increased urinary frequency associated with interstitial cystitis. It does not help with the pain or irritative symptoms. Dietary products such as citrus fruits, coffee, carbonated drinks, tomatoes, alcohol, and spicy foods have been seen to exacerbate symptoms. A trial of avoidance of these products can be worthwhile. Physical therapy for pelvic floor exercises can be beneficial, especially if pelvic floor muscle spasm is appreciated on examination. Lastly, cystectomy would be the last resort treatment for these patients. 1) Am Fam Physician. Interstitial Cystitis/Painful Bladder Syndrome. 2011;83(10):1175-1181. 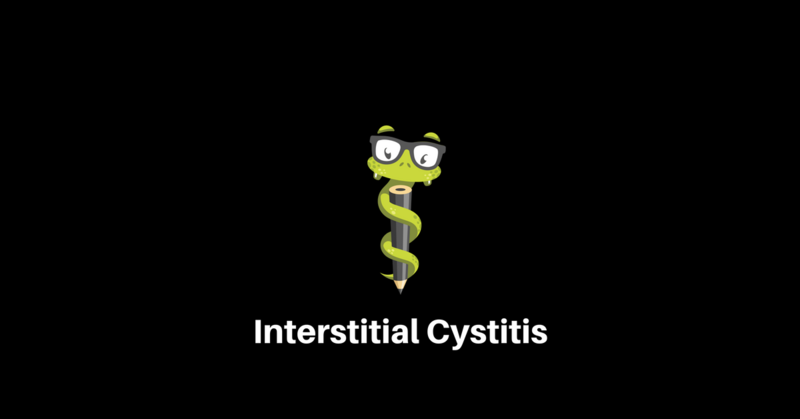 2) Ferri’s Clinical Advisor, Interstitial Cystitis. 2017. 3) Family Practice Notebook, Interstitial Cystitis. Accessed: January 20, 2018.